I’m so pleased to be reviewing The Bridal Party by J.G. Murray today as part of the blog tour. My thanks to Anne Cater from Random Things Tours for the place on the tour and Corvus Books for providing a copy of the book for review purposes. The Bridal Party appealed to me straightaway. I loved the idea of a group of women being cooped up in a house together playing a murder mystery game. It’s a quick read and so I raced through it in the space of a day. Clarisse is the hen in question and Tamsyn is her friend who has organised the hen weekend, along with other friends, Nada, Gaia and Alfreya. They seem like a tight-knit bunch. Gaia and Alfreya are Clarisse’s schoolfriends, whilst Tamsyn and Nada are colleagues, but all seem to get along well. But then Tamsyn lets them know that she can’t make the weekend which seems all a bit odd, and strange things start to happen. The group know that Tamsyn has organised everything, including a murder mystery game, but even for a game the things that are happening seem a bit extreme. This is a book that got more and more sinister as it went on. I was reading part of it at night and I did feel a bit perturbed by it. The whole weekend would be my idea of complete and utter hell! Everyone starts to mistrust everyone else, there’s a sense of foreboding and ooh, it makes me shiver to think about it! There are several twists and turns in the story and I did start to work it out but I thought it was a really cleverly plotted book. I had to suspend disbelief at times but to be fair I’ve thought that about plenty of other psychological thrillers. I think the genre sort of demands it. 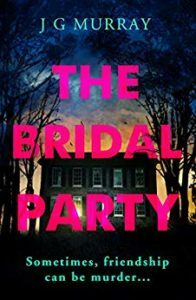 The Bridal Party is fast-paced and thrilling, creepy and disturbing. It’s a great debut.